This brand new and high quality Self-Portrait Mono pod is perfect for Traveling, Hiking, Camping, Weddings, Parties, Concerts, Aerial Photos, Sports event etc. 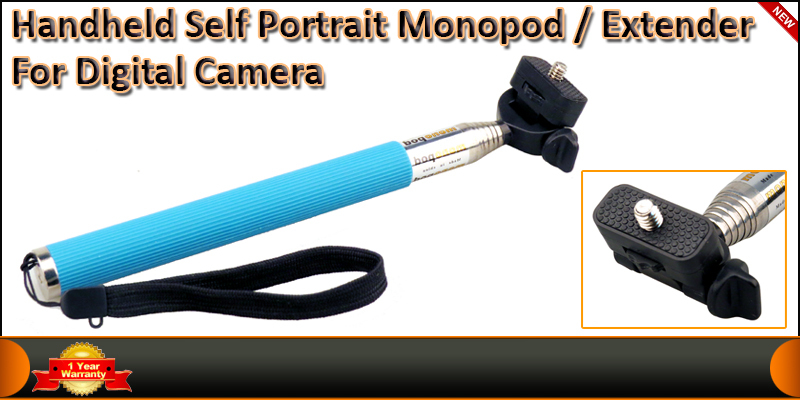 With this extendable and adjustable self-portrait mono pod capture photos or videos above the crowds or in hard to reach places. Just setup time or video mode on camera and press capture button. Then Extend, Aim and Smile. Made from stainless steel material, fits easily in pocket and includes a wrist strap. Include yourself quickly and easily in photos and videos. Self-portraits without the help of strangers. Capture a moment when you don''t want anyone else there. Fits in your back pack or camera bag. Attaches to camera''s tripod fitting. Use underwater with waterproof camera.